Sometimes taking the road more traveled can bring you perspectives and experiences that we all know and love. Adding to my list of autumn favorite locations is a popular park in our nation’s capital. 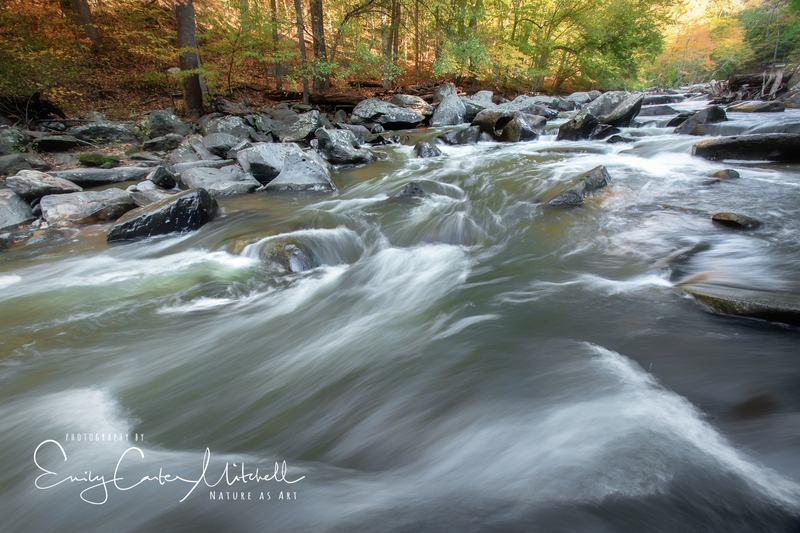 Rock Creek Park boasts a strip of protected natural land with Rock Creek flowing through it from the DC/Maryland boundary to downtown DC. 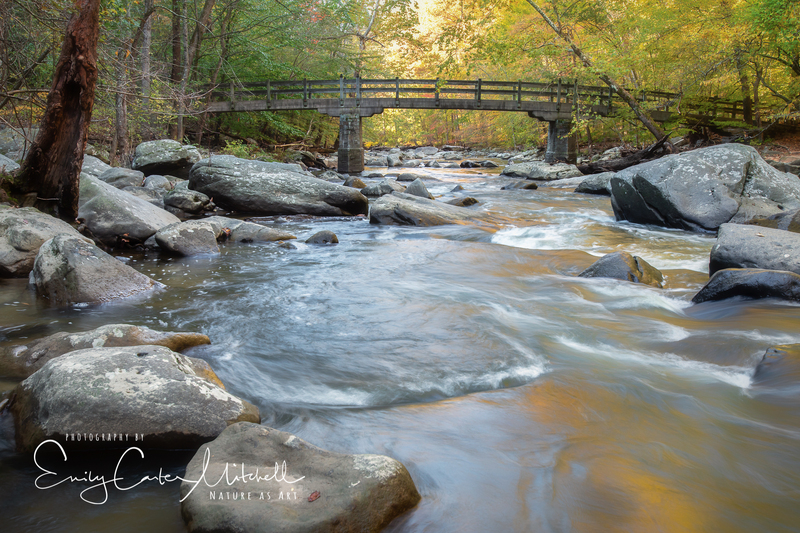 The creek runs past the National Zoo, historic buildings and rocky terrain. In particular, one section near the Nature Center is considered the “Rapids” Section with large boulders strewn along the river bed for over a mile. The forest surrounds the river and is beautiful regardless of the season. Within the rapids section there are three historic bridges that date from the early 1900’s. 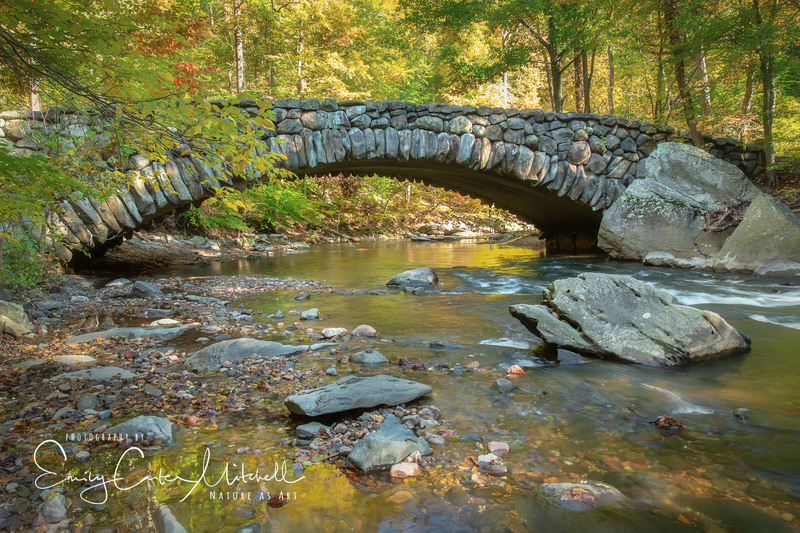 The boulder bridge is the most popular one of visitors and when driving down Beach Drive during the week on might not even notice it’s beauty as you’re driving over it. On the weekends, Beach Drive is closed to cars and one must hike into the park to arrive to the bridge. Along with the Boulder Bridge, there is also the Rapids Foot Bridge which is a serene spot with views on either side of the bridge. Along the trail are numerous spots one can boulder scramble to the river’s edge and capture some beautiful slow exposure scenes with the forest as a backdrop. It’s a bit precarious to boulder scramble on wet and slippery rocks and especially for a photographer that has a tripod and camera in one hand that can throw you off balance. A photo buddy would certainly help as one can hold the camera while the other gets situated. Otherwise, take your time and be safe. Certainly one of my more favorite places to visit. Thank you. Beautiful photos! Yikes, it sounds a little risky… Watch your footing! Thank goodness for the preservation of such beautiful natural areas – great find! I think it’s maybe because I’m getting older and not quite as spry. Getting hurt, well….hurts! I’m also grateful for natural conservation. Thank you. A beautiful setting – hard to believe one is in an urban area! Oh it is so true ! And you know, I forgot the best part of the story. When we were walking along the river, we saw a buck swim across it and just stroll across the road. Totally calm and not afraid. It was awesome. Thank you for your kind comments Eliza. I imagine that must have been a breathtaking sight! Thanks for sharing it.